#1,556 Professional Porch. – Laurel Mercantile Co.
Now reading: #1,556 Professional Porch. 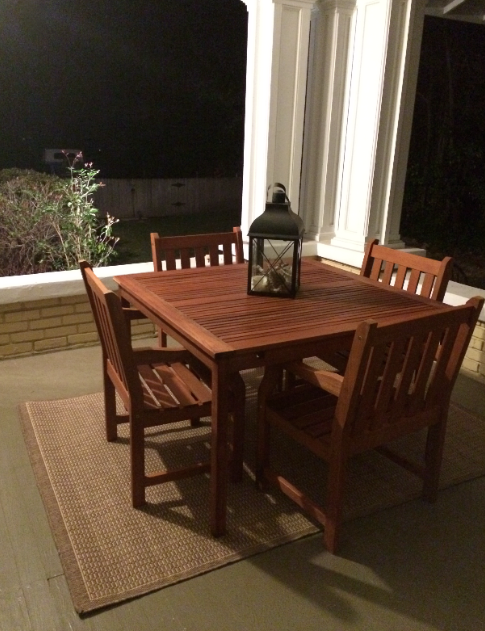 Our porch got a facelift with the new dining set we found for an awesome price on Overstock. Free shipping, too. With a drill, it only took 5 minutes to assemble the chairs and our old $15 craigslist table will be finding a new home. Next up, got to get some fun striped cushions for those big chairs. Can’t believe we found some that are Napier size! I’m excited to hopefully spend some time out here while I’m recovering. This time next week, I’ll be in the hospital and done with my second surgery. Getting a little more nervous (and honestly EXCITED) as the days are drawing nearer, hoping and praying that they find what’s wrong and can fix it once and for all. It’s like Lisa told me it was for her—the first surgery was terrifying because of the unknown, the second surgery she had a more clinical understanding of it and it wasn’t so scary. I’m there now, thank goodness. Would really appreciate your prayers next Wednesday, if you’re the praying kind and if you think about it.